a pretty view of knaresborough. my first tryout of my camera, was disappointing day but took this pretty shot. Thats a nice one, neat bridge framing. where? 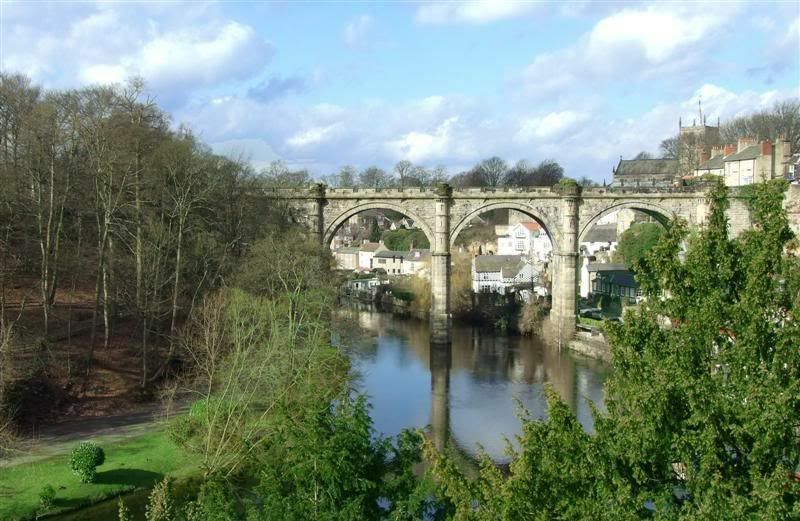 knaresborough is a pretty town near where i live in north yorkshire. This is very very nice! A great composition, nice lighting, sharp and topped off with a lovely sky. Well done! cool, my sister moved to Bedale last year. Lovely area. ah yes, see it now!! thanks again for any suggestions, all received gratefully. I agree with this assessment except that I would crop the lefthand side upto the little bush near the river. yes i assumed that what was meant!! and have done so, looks ok. this was day one of taking my camera out and all the colours were washed out and i was so disappointed. my husband has a little ixus and his colour was fab!! have since changed a setting and colour has improved. I think you have a wonderful scene there. Great weather, beautiful blue skies and white clouds. Just I would have moved over and gotten rid of the trees so they don't cover up your water and bridge. i couldnt unfortunately as there was quite a drop down the side there!! i could have got a good shot as my husband pushed me off the edge though!! Jono, Bedale is only 15 minutes drive up the road to where i live!! and yes it is a fab area. i am from London so i think i appreciate it all the more!